This is the stitch I use when sewing two pieces of fabric together, like side seams on a bodice or stripes or anything that I later fold and finish the seam. 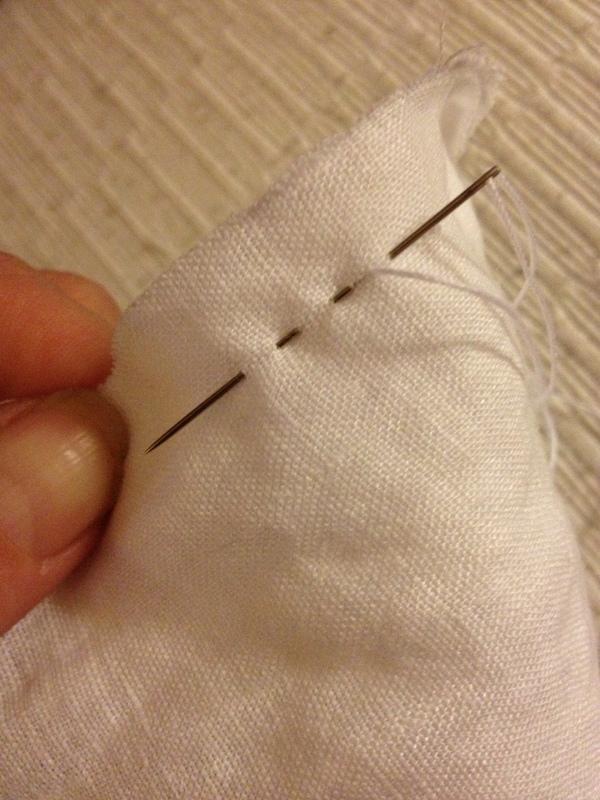 Run the needle 2-3 times, with about 5 mm spacing, go back one stitch, and then run the needle 2-3 times. 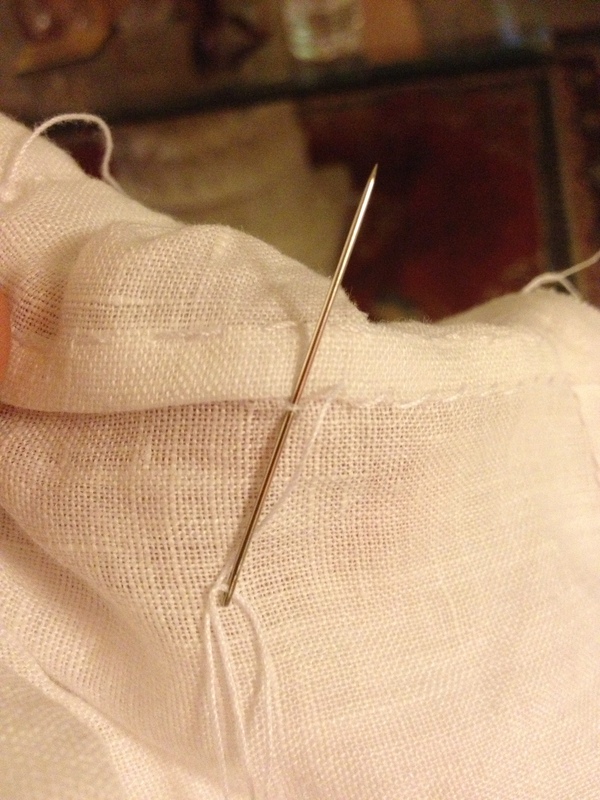 The back stitch ensure that you don’t accidently start to pull the fabric into pleats, and makes it easier to keep the seem firm, if you look closely on the picture, you can see the little back stitch next to the base of the needle. 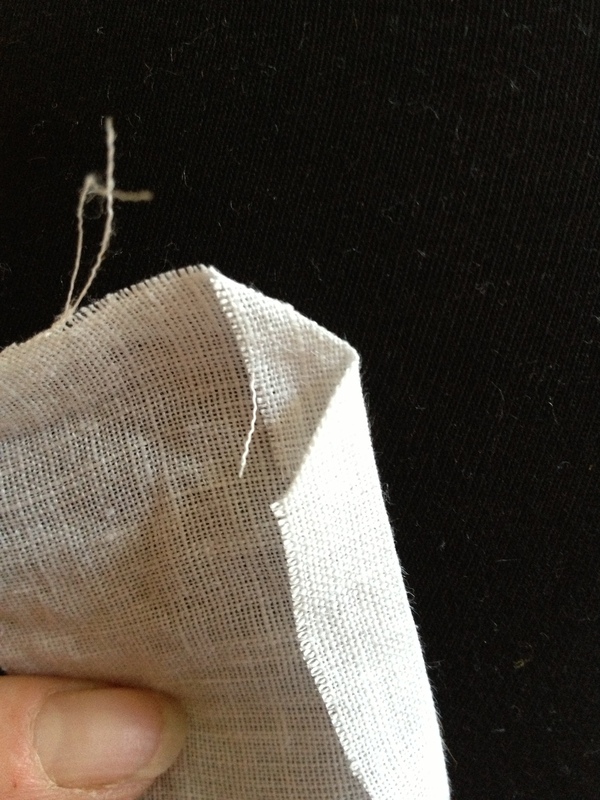 The seam allowance depends on the material: I usually use a 1 cm for a thin linen or wool that I don’t finish the seam on, or 1.5 or thicker linen and wool that needs to have a finished seam. 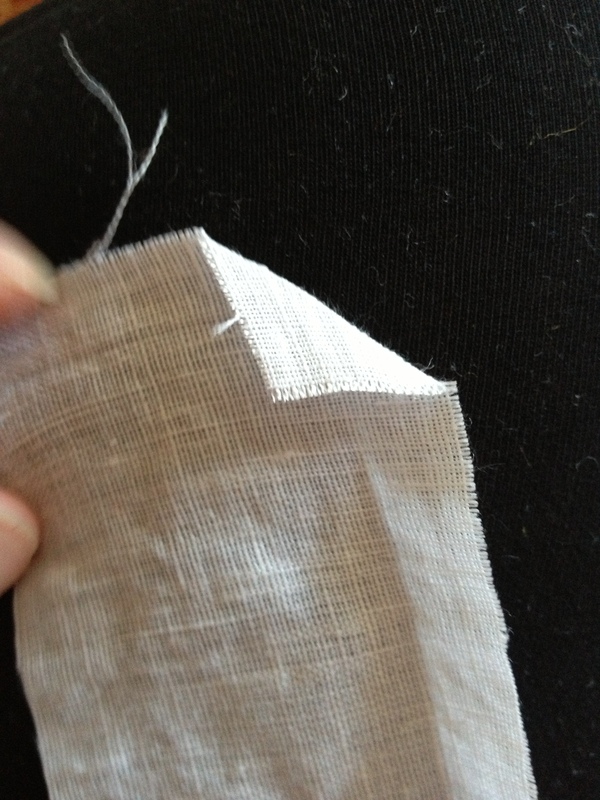 Then cut half of the seam allowance on one piece of the fabric, double fold the other piece over the cut part and hem stitch it down as fine as you can to finish the seam. 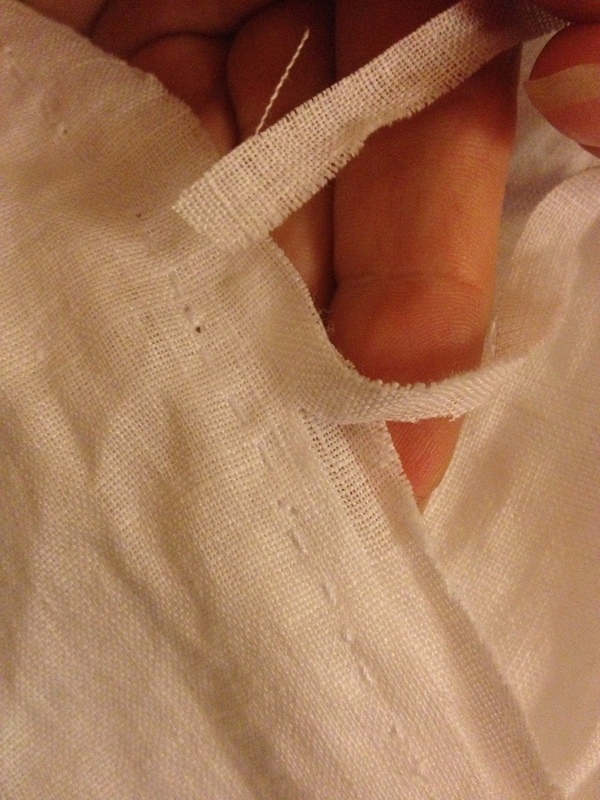 When hem stitching, I usually pick up around 2 threads on the fabric, that is enough to make it last, and will make the stitches in the front almost invisible; the right picture shows the front of the seam, and you can see the stitches as little dots on the top of the seam. I rarely finish the seam when sewing in wool. Why? Because it’s felted (not all wool are felted, you will notice the different when you cut it) and will not start to fray as linen does and because I don’t wash it. Well… you see, wool is a natural fiber, the natural oil prevents most of the dirt from getting inside it, and the underdress you wear prevents your dirty body from soiling it …An old trick to washing a wool dress is to lay it outside on the grass in the dew, the moisture in the grass will draw the dirt out of the wool …or just hang it in the bathroom when you take a shower. And don’t forget to hang it outside, preferably over night, directly after an event. IF your dress is really really dirty (like when I was pouring beer for six hours at Kapitelhusgården in Visby the front of my dress was completely soked in beer), then you might want to dry clean it. …but washing wool in a machine kind of removes the natural water/dirt repellant of the wool fabric. 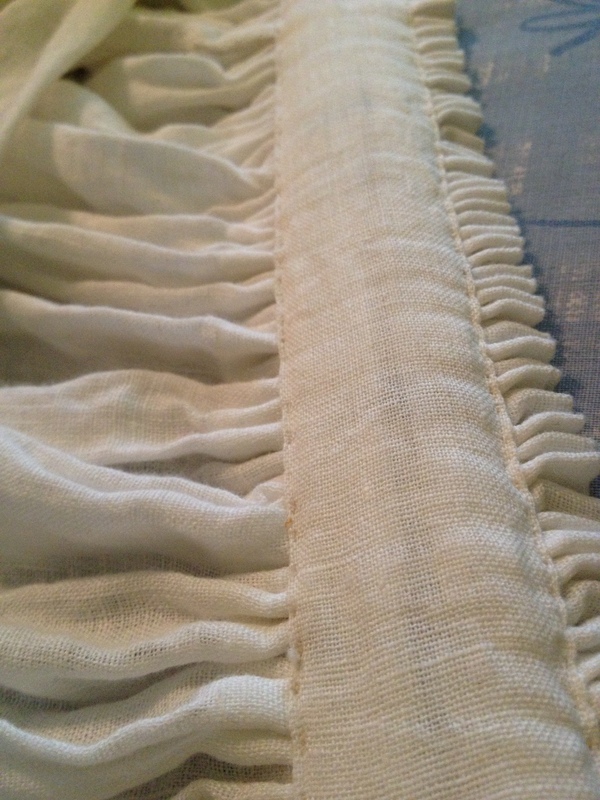 -Try to always maintain a straight line, use the needle as a guide, always keeping an eye on the edge of the fabric. 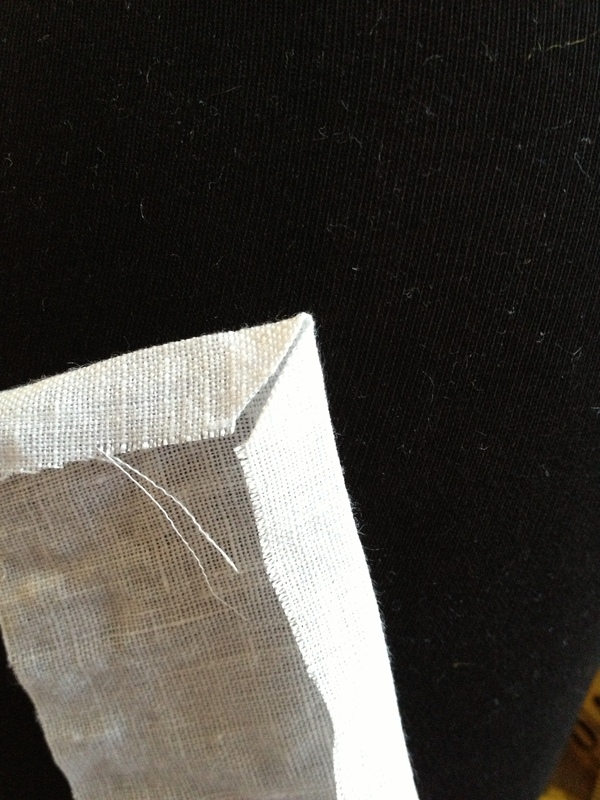 Don’t use too much seam allowance, since it will be harder to get a straight seam. 1.5 cm seam allowance is always a good start, and if it might be a bit tricky to keep the seam straight, then draw some guidance lines every 10-15 cm. -Don’t pull the fabric to hard when sewing the bodice; the fabric has been cut on the bias and will be strechy, always pin the fabric at the beginning, until you get a right firm grip on the fabric. 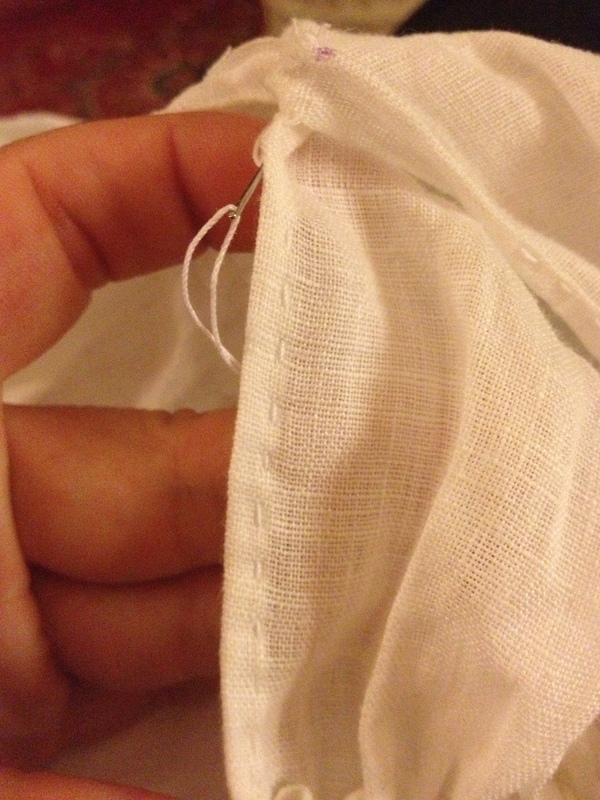 Linen; use the pull-a-thread technique: cut a small cut in the end of the fabric, carefully pull out a string of thread until it breaks. Cut at the visible line until you reach the end of it, then pull out another string …and so on. This will get you a precise and straight cut. 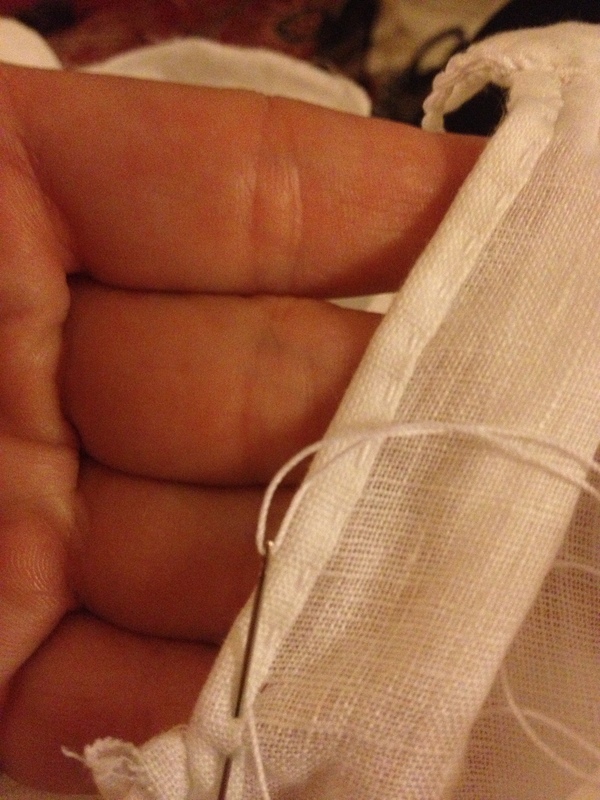 – Last but not least: Hand sewing is easiest to do with wool or linen and with a sharp needle and a linen thread (okey, I know it’s very hard to find a good linen thread, then at least use a thicker cotton thread (look in the embroidery section for example), NOT standard machine sewing thread! 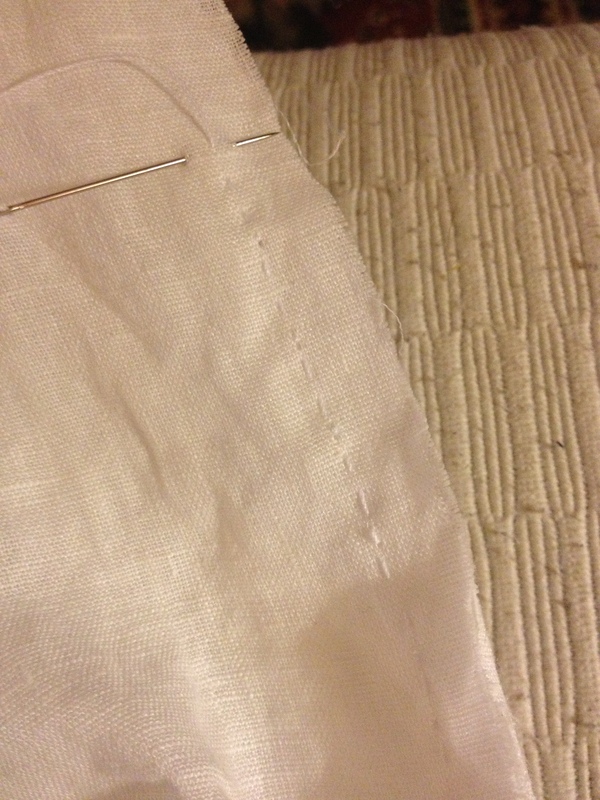 It is so thin that when you put any stress on the seam, the thread will cut right through the fabric.) …the thread is not suppose to be unbreakable! 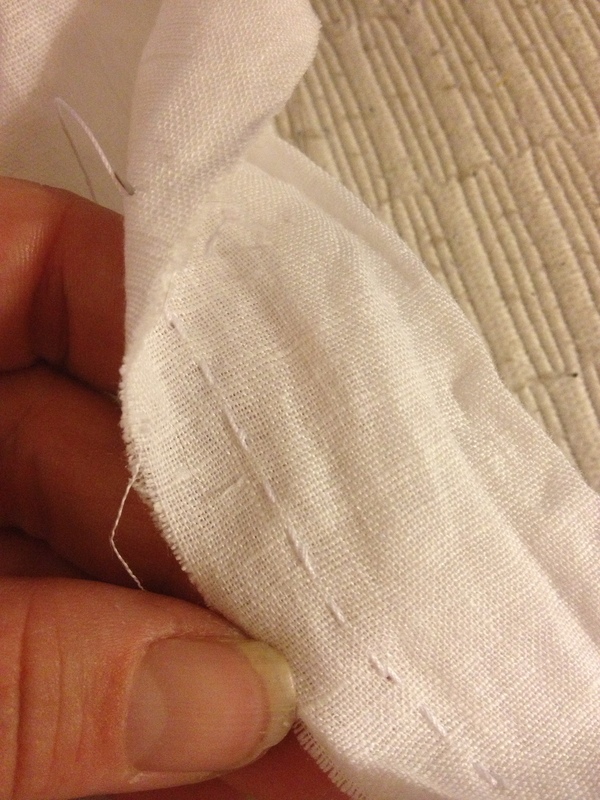 Because if your seam has a lot of stress, you actually want the thread to break; you can always re-sew the seam, but it is very tricky to fix ripped fabric. 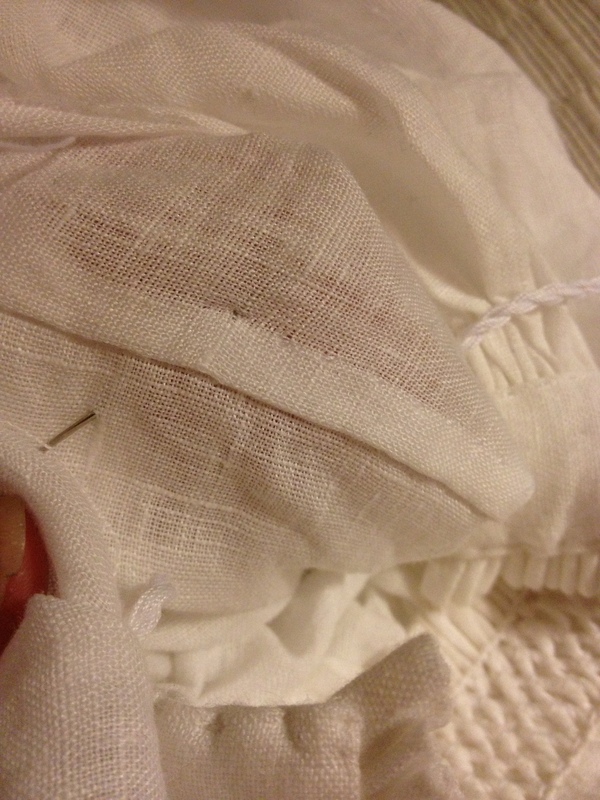 There is a number of other kind of stitches that you eventually would want to use in the future, these stitches will get you started at least, and if you are interested in other period stitches, then I recommend you to google “archaeological stitches”. 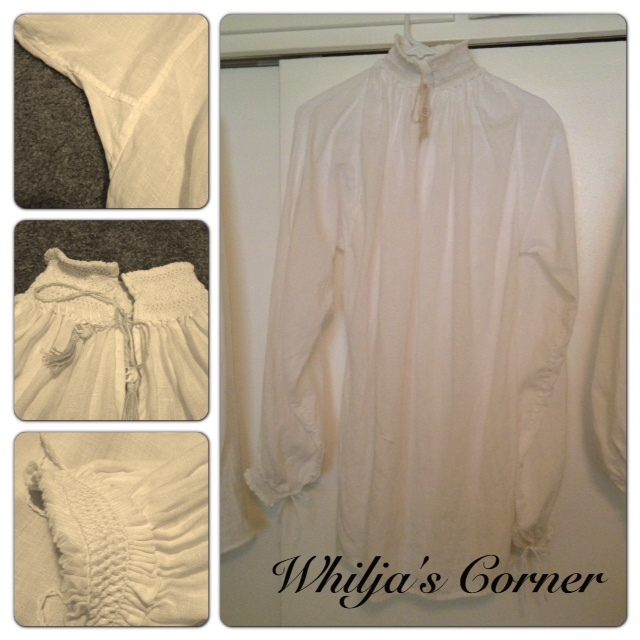 This entry was posted in Sewing and tagged 16th century shirt, chemise, Handsewing, Landsknecht, linen, pleatwork embroidery, Running stitch, Seam allowance, Sewing, smocking, Trossfrau.